As the needs of our customer's change, JIT changes with them. The fabrication industry is getting very critical in the area of cosmetic and surface finishes. 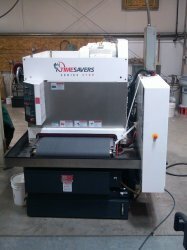 Seeing the need to improve the quality of our surface finishes, JIT has invested in a new Timesaver Surface sanding machine. With the ability to put #4 brushed finish, a DA sand finish or anything in between, JIT is now able to put that custom finish on surfaces from aluminum, Stainless Steel, and Carbon steel. JIT is able to produce a better quality part by providing a clean and consistent surface finish. Along with the timesaver we have also added our new Fladder Deburr machine with the ability to completely deburr sheets up to 37 inchs wide. No longer will you have to worry about burrs in the edges and interior holes and features of your part. 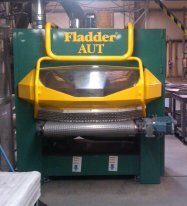 The Fladder gets them every time while providing a DA sand surface finish. 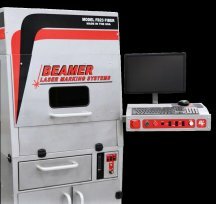 Rearick Tooling/JIT has added a new laser-etching machine to their arsenal of services. We now have the ability to etch larger parts. We can import your logo, special design or mark your part with the part# and corresponding Barcode. We can locate your identification with precision. Let us leave our mark.